My husband and I are in the process of updating our window coverings in our home. We are in a pretty neat situation where we only have one window per room in our house so we are ordering several types of window coverings. The one we are most excited about is the NewStyle® hybrid shutter we are putting in our master bedroom. I used to be a very heavy sleeper, but in the past few years I wake up at everything and anything. And light is one of my worst enemies while sleeping. We currently have these horrible vertical blinds in our house and we can’t open windows because they rattle. Light from the street lamp behind our house also seems to find its way into our room, and of course, right into my eyes at night. So, I’m incredibly excited to have something in our bedroom that will allow me to open my window without obnoxious noise, while still keeping light out of the room. The NewStyle® hybrid shutters are very neat. These shutters combine the great style of wood with the strength, stability, and straightness of advanced modern-day materials. This is also an affordable alternative to all wood shutters while still providing the elegance of quality shutters. The shutters have two options on tilt bars. You have the classic front tilt bar which you will see in the middle of the front of the shutter. But they have also come out with a back tilt bar (seen below) that hides the tilt bar in the back of the shutter to give you more view through of your window. Explore the possibilities in your home with a complimentary in-home consultation! I love living in Colorado. We have the beautiful mountains, the wide open plains, and great city life that give us a long list of activities that you can do, no matter what the weather is like. Many homes here in Colorado are built to show the beautiful views, whatever the landscape is. Builders often spend a lot of time focusing on creating these beautiful big windows that allow breathtaking views. So when it comes time to find window coverings that will work, many home owners are befuddled. Do you keep the windows uncovered and keep that great view while risking privacy? Or do you cover the view and keep the privacy of your home in tact? Why not have both privacy AND a great view? All while keeping your energy efficiency level up pretty dang high! 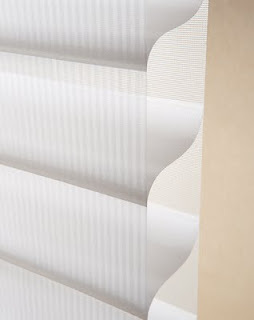 Hunter Douglas has a great product called “Silhouette” which allows great see-through, a vane tilting option that allows privacy, and the two layers of sheer fabric also provide 88% ultraviolet protection (Up to 99% when the vanes are closed completely!). Silhouette has a S-Vane that is suspended between two sheers which diffuses softened light deep into the room. The vanes can be tilted and closed to provide privacy. Silhouettes are great whether you have a view to die for or you just want something that will help you keep track of kids playing outside all while keeping the UV damage to your furniture or flooring at bay. So when you are looking for privacy, view through, great light, and UV protection, make sure you check out Hunter Douglas Silhouettes! 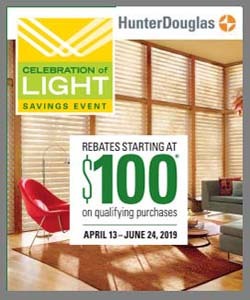 From now until September 11th Hunter Douglas is having a great rebate promotion as well! 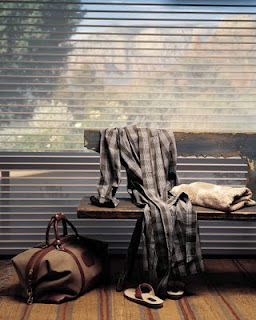 Save $100 on 2 Silhouette window shadings plus $50 off eachadditional unit! Let us help you explore the possibilities with a complimentary in home consultation! At the recent design shows in Frankfurt and Paris, I witnessed a trend and want to share it with all of you. It consists of three Rs: Rediscover, recycle, and reuse. Let’s start with rediscover. Have you heard of the saying, “Everything old is new again”? Your old stuff might look new, so go for a treasure hunt in your house or maybe a relative’s. Check your basement, closets, attic, and garage. Recently, my mother moved from Atlanta back to the Chicago area by me and needed some help getting settled. While I was unpacking boxes, I found some treasures that my mother had found from years ago. The pieces looked great in her new house. Also, I rediscovered new looks for some of the existing window coverings. 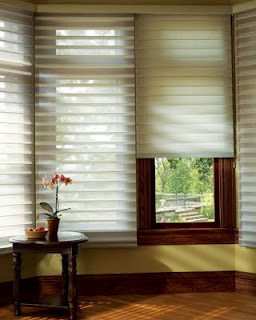 The previous owners had installed Country Woods® Genuine Woods blinds in the bedroom. With the cottage style of the home, we decided to soften the interior by hanging embroidered sheers over the blinds. I discovered the feminine look my mother wanted that also allowed for perfect control of light and privacy. Second is the recycle. Of course, we all know recycling as sorting our garbage into the right bins, so it can be properly disposed. That said, recycling can also be using our trash and making it into new products. I have seen furniture, rugs, and even toy animals made out of old newspapers or magazines. I have a tote bag of soda pop tops made by this Italian company. They also create vests, belts, and purses out of pop tops. Here’s another twist on recycling. Remember the other saying of “One man’s treasure is another man’s trash.” In this spirit, gather your friends together with all of their recycling goodies and have a recycle party. Think of furniture, accessories, floral arrangements, draperies, and artwork. Think of pieces that still have some legs, but you are just tired of them or transitioning to another look or set of colors. What about that green velvet chair you have? It might look magnifique in someone else’s house (I have been in Europe too long!). The party could be exchanges or small prices on specific items. Either way, it’s an excellent system for recycling your items and picking up “new to you” things. And the spring season certainly sets the mood for this kind of party. Reuse is the third R. Have you ever gotten tired of your house? Do you feel like you’ve been dusting the same accessories on your coffee table for the past ten years? Are you tired of that old floral arrangement on your foyer chest? How about your living room furniture? Maybe your house feels stagnant, because everything is the same way it was 10 years ago. Here’s what to do. Everyone has a close friend who has an eye for design. Enlist their help. Start by removing all of the accessories from a particular room. Next try moving the furniture and see if you can improve the visual conversation between the different pieces. Here’s another question: Do you have too much furniture or not enough? Try shopping the other rooms of your home for some pieces. Next arrange the accessories (don’t forget to shop the other rooms for these items). The ginger jar that has been on your dresser since the Ming Dynasty might look smashing on a stack of three books in your family-room bookcase. That old floral arrangement might be just the ticket if you remove the silk flowers and bare stems, and placed green moss inside around the stems. How about situating the arrangement on your mantle? It is fun and inexpensive way to reuse. The three R’s—rediscovering, recycling, and reusing—is all about working with what you have and making your home a better place to live. I hope you enjoyed this column as much as we did! Visit our Merchant Circle page to take advantage of these great offers from Hunter Douglas on some of their products! If you are looking to replace or upgrade your window coverings, this is a great opportunity to save some money! Offer ends September 12th! Please email or call Pat to schedule your in home consultation today or stop by our showroom to take a look at our displays! I’m a photographer, so light is pretty important to me, as you can imagine. The first thing I think of when I start learning about new products from Hunter Douglas is what type of light would be let in or kept out. 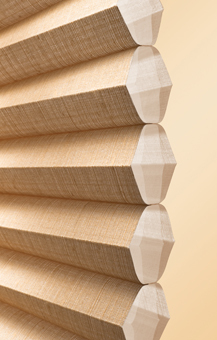 This afternoon I started reading about the new Duette Architella with IllumiCell Honeycomb Shades and saw that they are now making them out of bamboo! Now, a little information about these Architella Batiste Bamboo Honeycomb shades: Honeycomb Shades illuminate your home with soft light, while providing complete privacy and exceptional energy efficiency. They call these Honeycomb shades because of the shape. If you look closely at the picture, you’ll see that there is an outer cell and an inner cell. The clear inner honeycomb is engineered to provide better light transmission. The increased light through the cell allows the texture on this bamboo fabric to be more visible while still providing the same superior energy efficiency as the original construction of the Architella Shades. So for those of you looking to go green, this is a great option. Not only is it a big energy saver, but the Batiste Bamboo is also made from fibers of one of the world’s best renewable resources and contains recycled materials. Oh, and did I mention that you can get a Federal tax credit for up to $500 for 2011 when you purchase this product (visit hunterdouglas.com/taxcredit for more info)?! Talk about going GREEN!! Put some of that green back in your wallet and come visit our showroom today for a look at this great product from Hunter Douglas! Monday – Thursday- 8:00 a.m. – 5:00 p.m.
Friday- 8:00 a.m.- 4:30 p.m.